The purpose of the club is to bring together people with similar interests, koi and ponds, giving them the chance to share their knowledge and experiences. The club is open to all. There are many activities throughout the year - meetings, auction, pond tour, koi show and so on. Club membership entitles you to all these benefits plus ten issues of our great newsletter per year which is full of interesting articles, contact information for different concerns you might have about your pond and koi, schedule of events and more detailed information about the current club events. 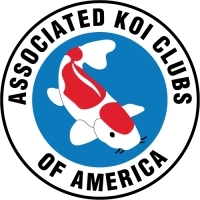 You also become a member, through the club, of Associated Koi Clubs of America (AKCA) which is the national organization of koi clubs. Visit their website by clicking on their logo at left. There are about 85 clubs nationwide that belong to AKCA. Please feel free to contact any of the people listed in the Contact Us section of our website.